Here's my throwback thursday...a "travel back in time on Kandee's life" picture....and if anyone ever wanted to know if I went through an "awkward phase"....this would be it! Please look at my stupid bangs. I don't know how they got cut like that, but thankfully, hair grows. As I have been comforted, with every ugly haircut. 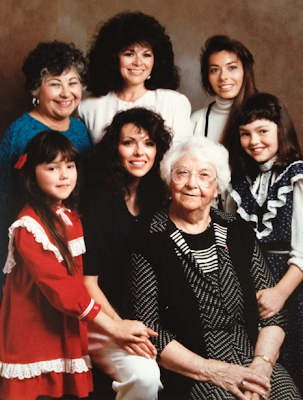 My little sister Tiffany (in the red), My mom, Shannon (in black shirt), My Great-great Grandma Nellie (with the white hair, who is warming up Heaven for us), and Me- with the "stupidest" bangs ever....just look at my hair cut! ha ha ha and the navy and white lace dress. And yes, I look as though I was trying to bring the "Little House on The Prairie" look, in style with my dress. I think we were at Sears or JC Penney for this portrait! How much do you look like your mum!!! Omg! My name is Nellie my moms name was Manuela but nick named Nellie From chihuahua Mexico and my aunt is also named Manuela and nick named Nellie ! OMG! Today, you just look exactly like your mom in that picture! You are both so beautiful!! Huge hugs and love from Brazil! Love your blogs and videos so much! I have some crazy 8 year old haircut photo somewhere too. You and your mum and your nanna look so alike its awesome! Aww what a lovely pic. Thank you for sharing. You look EXACTLY like ur mum! I thought. She was you for a while there. this picture confused me so bad!! I really thought that your mom was you :) y'all are beautiful ladies! !